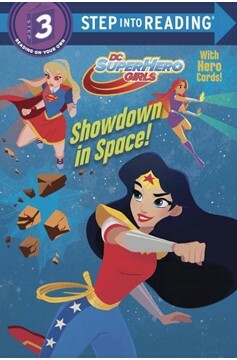 Wonder Woman and the DC Super Hero Girls take to the stars in this Deluxe Step into Reading for an epic cosmic adventure with awesome collector cards! Boys and girls 4-6 will love reading this Step into Reading leveled reader featuring Wonder Woman as she teams up with her Super Hero High classmates Supergirl and Ms. Martian for an awesome adventure in outer space. And the included collector cards add to the fun!.